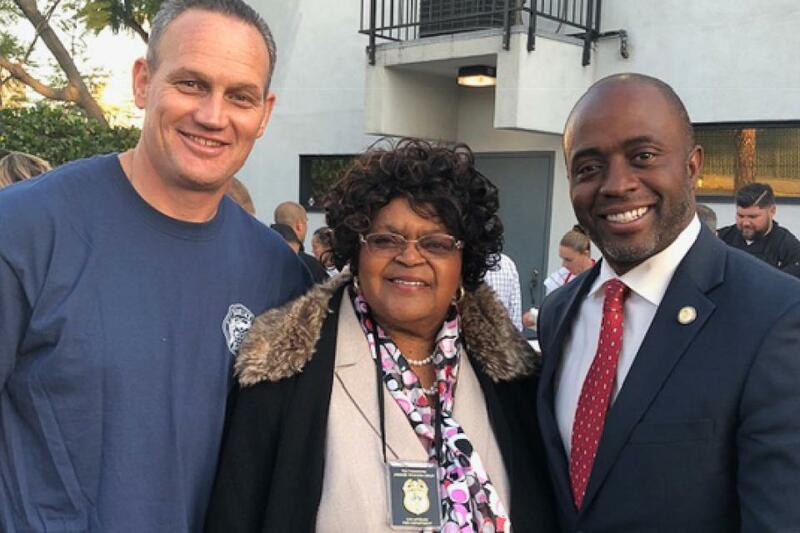 Tony Thurmond wins SPI race! 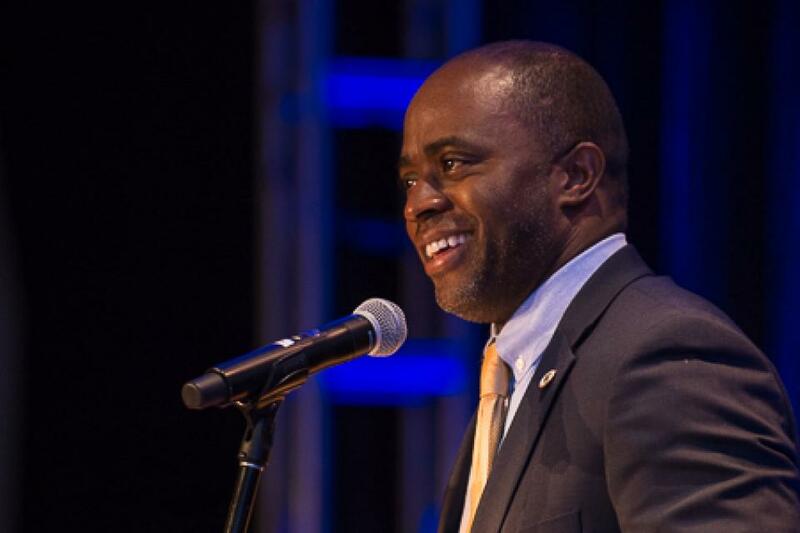 Following a hard fought campaign, Assemblymember Tony Thurmond has won the election to be California’s next Superintendent of Public Instruction. As anxious citizens watched the November 6 midterm election results, they weren’t at all sure how candidates and measures would fare. Results trickled in, but many races remained too close to call for weeks. Jeannie Wallace had considered running for office before. 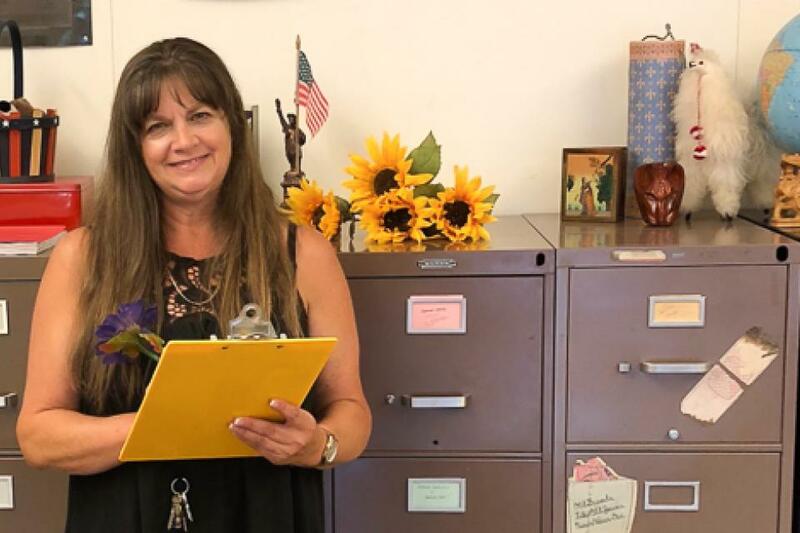 As a union rep for the Morgan Hill Federation of Teachers and the chair of the local Democratic Party Central Committee, she knew how hard it could be to find candidates for the school board. But she thought she was too busy, and planned to do it when she retired. AFT activists don’t stop being active when they retire. 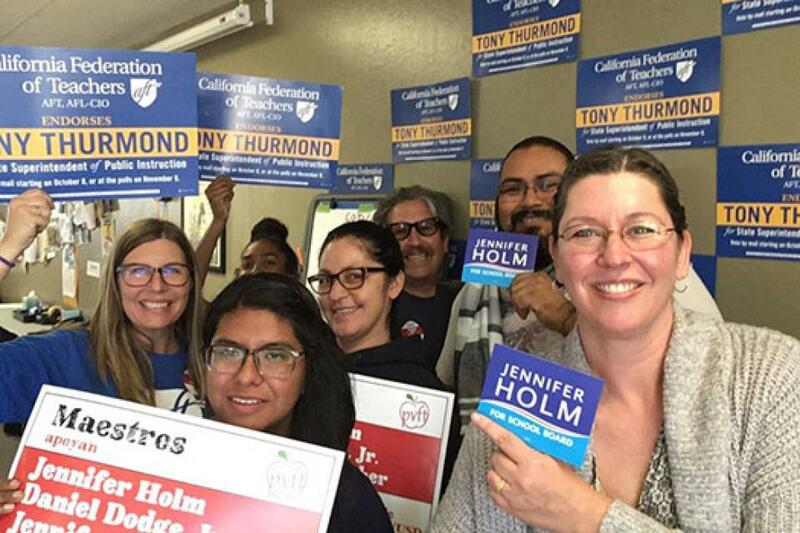 United Teachers Los Angeles retiree Jimmie Woods-Gray, for example, remains a whirlwind in the fight to stop the privatization of public education. UC-AFT Riverside’s Stephanie Kay, meanwhile, continues the daily fight for lecturers’ rights on University of California campuses. It’s not every election cycle that California finds itself with critical, competitive races, but 2018 is not just any election year. 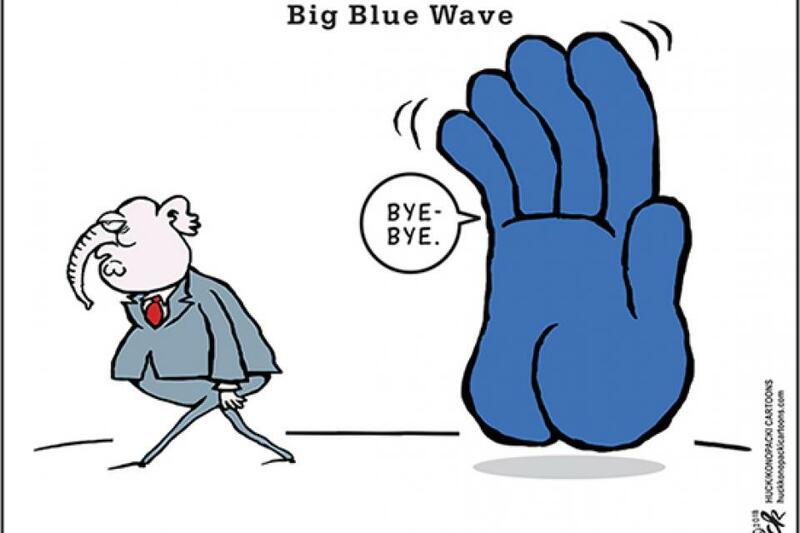 California is a battleground state to take back the House of Representatives. Jerry Brown is termed out, so voters will elect a new governor for the first time in eight years. And the race for state superintendent pits charter schools against public schools. 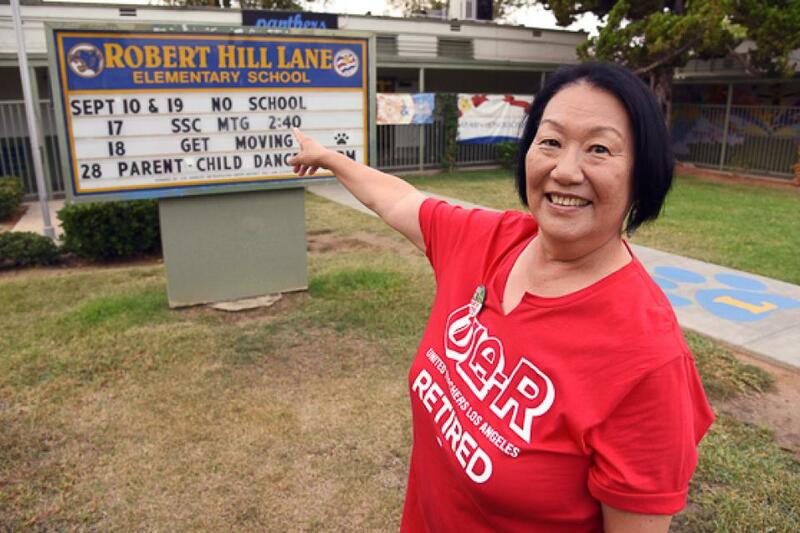 Contract negotiations between United Teachers Los Angeles and L.A. Unified were already heading toward impasse when UTLA-Retired members began to “adopt” schools to support in case of a strike. 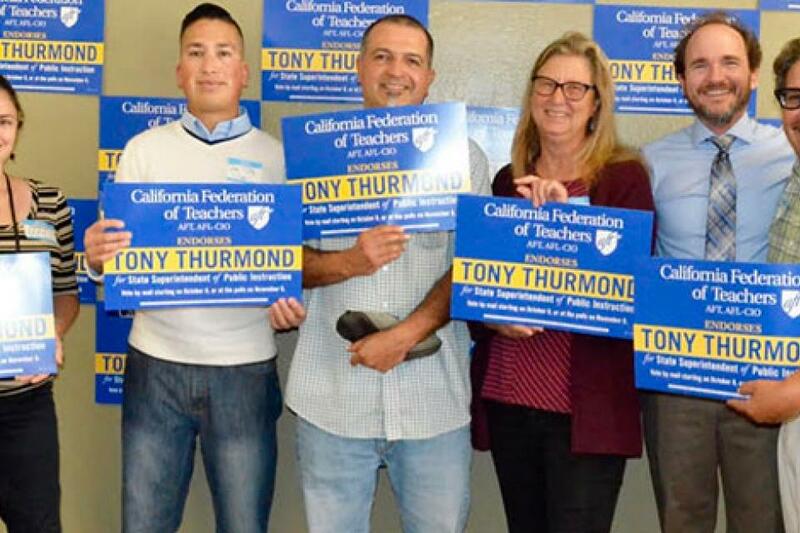 A couple of days after his speech at the CFT Convention in Sacramento last year, Assemblymember Tony Thurmond (D- Richmond) announced his candidacy for state superintendent of public instruction. He regrets not announcing at the Convention, Thurmond told delegates, who waved blue signs in his support. 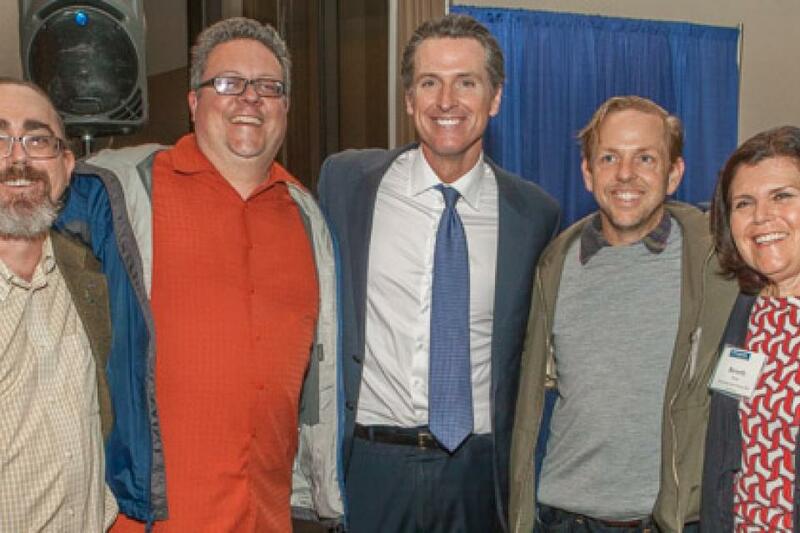 Members of the Novato Federation of Teachers with Gavin Newsom at the 2016 CFT Leadership Conference. Since Donald Trump was elected president, it has become clear: It’s a new day for educators, their unions, students and communities. California Teacher asked the presidents of four local unions from different regions of the state to voice their concerns. For Kelly Mayhew, an English teacher at San Diego City College, the day after Donald Trump won the Electoral College vote for president of the United States, was probably her worst as a teacher. 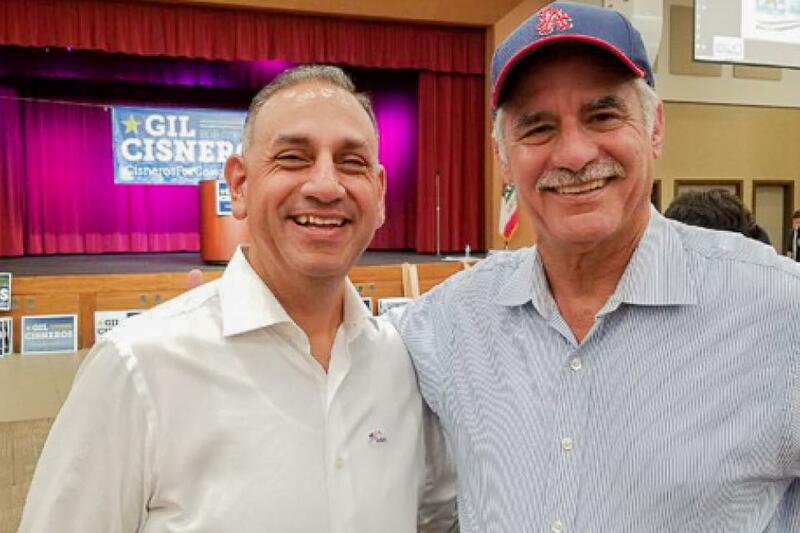 With the future of national politics uncertain, the role of the California Legislature in shaping public education policy and labor rights is more critical than ever. The work it undertakes in coming years will have a large and direct impact on members, their students, and their communities. Hillary Clinton’s historic run for U.S. President and popular vote victory didn’t just come out of nowhere. She and all the other women who are so much a part of our politics stand on the shoulders of the bold, creative organizers who came before them — women who never let a few losses stop them. Women with names we should know but probably don’t. One of these is Frances Nacke Noel. In a crowded field of 17 propositions on the statewide ballot, voters clearly saw the value of publicly funded education and passed CFT’s top priority, Proposition 55, with an impressive 24-point margin. Local elections directly impact schools and colleges. 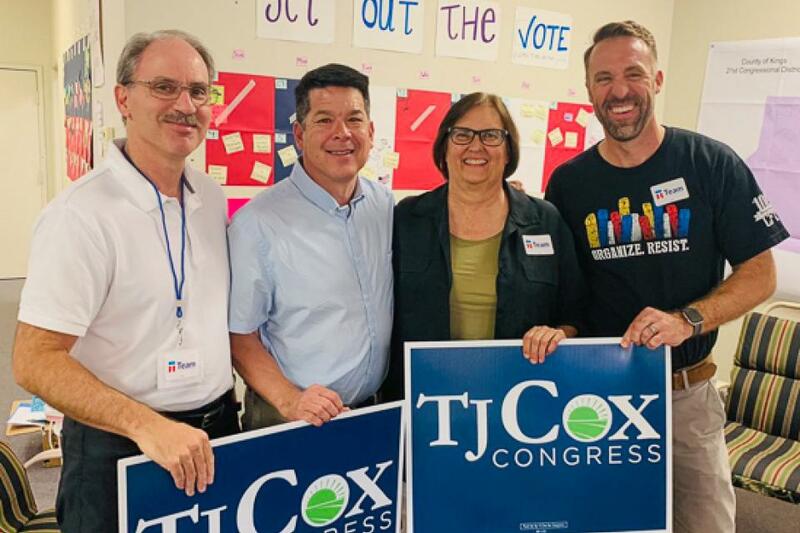 The grassroots work of CFT members in their communities not only secured funding and elected strong, labor-friendly local candidates, but will also help shape the political landscape in California.